Leaf holiday takes you to splendid view of Mustang an isolated district, from where you can observe Himalayan ranges and mysterious land. Mustang is often called desert of Nepal. The Upper Mustang trekking(popularly called the Mustang trek), is an exotic tour to unspoiled Tibetan villages on the other side of Nepalese Himalayan bordering with Tibet. The main highlights of Mustang trekking are ancient Tibetan villages, rare medieval Budhist arts, the exotic culture and the unique beauty of the Himalayan desert. 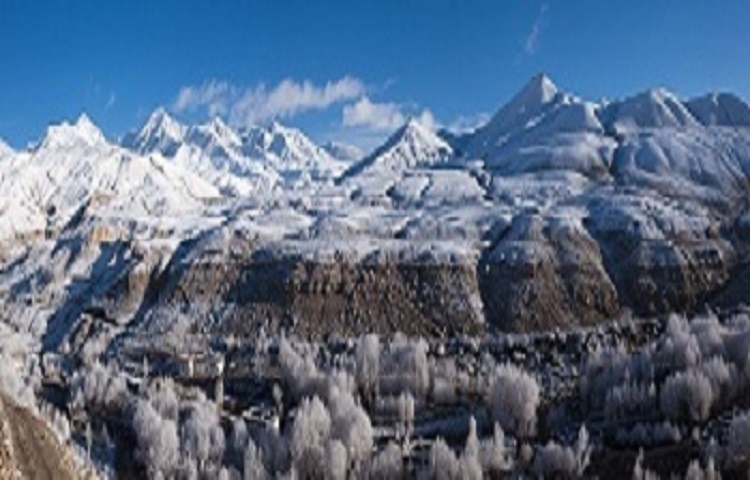 The medieval settlement of Upper Mustang and its capital Lo Manthang lie in the remote Himalayan desert behind the Annapurna and Dhaulagiri mountains. Foreigners were not allowed to enter Upper Mustang until 1992 . Upper Mustang is not much in contact with rest of Nepal, and keeps an aura of a remote, mysterious and unusual land, which is one of the unique charms of the Mustang trek. Geographically the land is an extension of the Tibetan plateau, characterized by windy and arid valleys, eroded canyons and unique stratified rock formations. The people in Upper Mustang are of Tibetan origin, migrated from Tibet centuries ago, and belong to Bhotias and Loba communities. They practice Sakyapa school of Tibetan Buddhism. Upper Mustang is perhaps the only place to see Tibetan culture in completely undisturbed state. The houses and monasteries in here have medieval look and unique local architecture. Mostly they are built with stone and sun baked mud bricks. Recently in 2007, an international team of explorers have discovered invaluable objects of cultural and historical importance in Upper Mustang caves. In high caves requiring technical climbing they have discovered beautiful Buddhist murals, and historical objects, dating back to , according to them around 800years ago. Those having longer holiday can extend their Mustang trek beyond Lo Manthang and visit these caves and further explore the region visiting many of its ancient monasteries and cultural treasures. A short 25 minute flight takes us from Pokhara to Jomsom .Hiking along the Kaligandaki gorge , the deepest in the world , we head for medieval village of Kagbeni.The trail north of Kagbeni leads to the Mustang trek.Depending on our itinerary , for the next 09 – 12 days we trek through the ancient villages of Samar, Charang and Geling before we reach the capital Lo Manthang at 3750m.Besides Lo Manthang , there are places of great interest including the Namgyal Gompa( which also serves as a local court) and the village of Tingkar, Garfuk and Nifuk.You still find people dwelling in the caves in these villages and some caves have amazing stupas and Buddhist murals . On the longer version of the Mustang trek, we futher explore the region and emerge to popular Muktinath Temple via Yara. After a visit to the holy temple of Muktinath we return by flight from Jomsom to Pokhara. 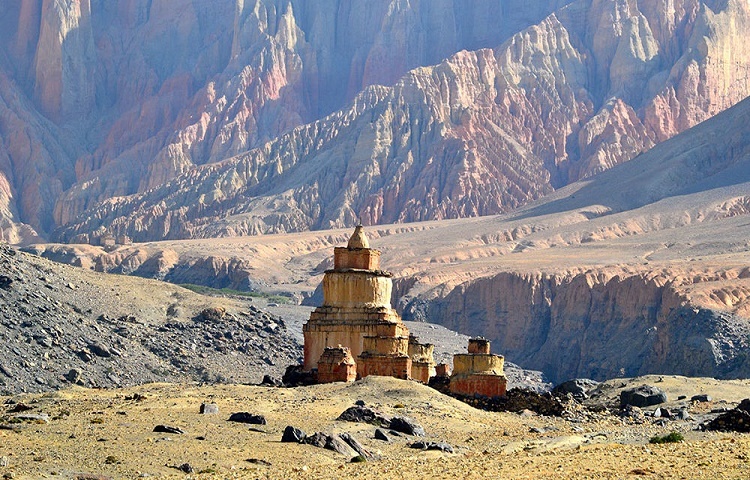 Upper Mustang trekking is not only a culturally rewarding tour, but also a rare adventure. This is a fully supported camping trek. You sleep in the tents and eat the meals prepared by our camp cook. The average walking is 6 hour per day and you carry just your light day pack during the trek. After an early morning breakfast you drive or fly to Pokhara. Overnight at hotel in Pokhara. From Pokhara the scenic flight to Jomsom for 20 minutes is done and from Jomsom the trekking upto Kagbeni the headquarter of Mustnag. Overnight at hotel at Kagbeni. The journey starts with a special permit check up and onwards to the riverbank of Kaligandaki . During the trial we have scenic place to stop through the sand and windy destination. This trails follows the hill and downhill. At first we reach Tangbe village with white washed houses, fields of buckwheat, barley, wheat and apple orchards.Then we trek to Chhusang and after crossing the river head up to the huge red chunk of conglomerate that has fallen from the cliff above, forming a tunnel through which the Kaligandaki follows. We head on to small ridges reach at Chele village. Overnight at hotel. Today, we start our trek again and walk further to Eklo Bhatti. We climb to Taklam La Pass (3,624m/11,923 ft) through plateaus and narrow stretches with scenic views of Tilicho Peak, Damodar Dada and Yakawa Kang. Then we descend a little to the village of Samar.We Climb the trail that goes above Samar village and then descend again. Another 3 hrs similar walk takes us to Syanbochen. On the way, we relax along the surrounding of cool rivers and natural beauty and junipers. Locals use the dried leaves of junipers as incenses to invite deities and start any auspicious work. We also pass by a cave famously known as Ramchung Cave. Overnight at hotel. After breakfast we trek uphill to the Yamda La (3,850m /12,667ft) passing a few teahouses, chhortens and local villages which is like Tibetan style of houses with open balcony. We cross mountain passes, and an avenue of poplar trees and fields of Barley. The climb to Nyi Pass (4,010m/13,193ft) would be a little longer. Descend to our overnight stop at Ghaymi the third largest village in the Lo region, Ghayami is surrounded by large fields most of which are desert or barren. Today we start the trek after breakfast with a pleasant walk. After crossing Ghaymi Khola, the trail climbs to a plateau and passes beside a very long Mani wall, a sacred stone wall made by the followers Buddhism. From the end of the wall the trail heads east to the village of Charang with a maze of fields, willow trees and houses separated by stone walls at the top of the Tsarang Chu canyon. There is also a huge white dzong and red Gompa to get to our teahouse for the night to spend. Today, we trek to Lo-Mangthang with a magnificent view of Nilgiri, Tilicho, Annapurna I and Bhrikuti peak. The trail first goes downward to Charang Chu Canyon and then climbs steeply after crossing the river. Further the trail ascends gently to the 3,850m windy pass of Lo, from where you can see the Lo-Mangthang Valley. While descending to Lo-Mangthang, views of the walled city appear magnificent with its hills on the Tibetan Border. Overnight at hotel. Today we explore the surrounding areas. Visit Namgyal Gompa and Tingkhar. Namgyal Gompa situated on a hilltop serves as an important monastery of the local community and for the court for the locals. After visiting Namgyal Gompa continue the tour to Tingkhar, the last main village to the northwest of Lo-Mangthang and stroll back to hotel. There is another option to visit the Tall Champa Lakhang "God house" the red Thugchen Gompa, Chyodi Gompa and the Entrance Hall which are the main attraction of this town. Another attraction is the four- storey building of the Raja's palace as well as the surrounding panoramic views of the Himalaya. Overnight at hotel. While returning from Lo-Mangthan, we take a different route . Trek to Drakmar via Gyakar with more than 1200 years old Ghar Gompa with Guru Rinpoche as the primary figure. The Gompa is also famous for its rock paintings. According to the legend, anyone who makes one wish at the Ghar Gompa, their wish is fulfilled. We explore the local area. We walk by avoiding the winds. Overnight at hotel. Today, we get back to Ghiling as our journey for our overnight stay after a long walk takes 5-6 hrs. After arrival and lunch enjoy the day exploring the area. Due to dusty wind its better to walk in the evening. We return to Geling after 5 hrs walk for overnight. You will have wonderful scenery during the journey with a mountainous view. Enjoy the trip and overnight at teahouse. The last day of the day would be a long one. Better to walk early start as before and trek to Kagbeni. Finishing the upper Mustang trails and we join the normal Annapurna circuit trek. After lunch at Kagbeni will head on to Jomsom for the overnight stop. This day you can go to Muktinath with the guide too. We fly back to Kathmandu from Pokhara by ending our journey. Your farewell will be done by our officials this day. After some gift purchase form Thamel we take you back to hotel. Overnight at Hotel.